Harney & Son's Hot Cinnamon Spice. 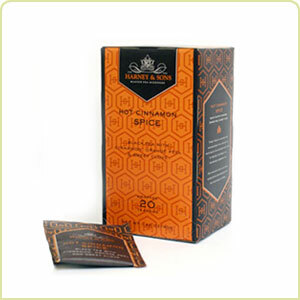 This is an assertive blend of black teas, 3 types of cinnamon, orange peel, and sweet cloves (no sugar added). 20 Individually wrapped sachets. Each sachet brews a 12oz cup of tea. Naturally sweet. Caffeinated. Kosher. All contents of this site © Paris Brothers, Inc. All Rights Reserved.